Deliberate motherhood? I guess that’d be getting pregnant on purpose. Maybe it’s mindfulness. Thoughtfulness? A desire to be intentional about the way I raise them. An awareness of how important this work is. And maybe it’s not, maybe it’s none of these things, maybe I still have a long way to go to figure it out, but here’s the difference: I’ve thought about it. That to me is the heart of deliberate motherhood. It’s the mission of Power of Moms to be a gathering place for deliberate mothers. When a friend first set me a link years ago to a story published there, it felt like a deep breath amid the frantic “what to buy / how you have to do this / why you need to worry” tone I felt from so many parenting magazines and websites. I loved that Power of Moms was a gathering of different voices, a celebration of diverse perspectives, and a community of women who were trying to be mindful about what it means to approach motherhood deliberately. None of us are deliberate all the time. Plenty of days I parent on auto-pilot. 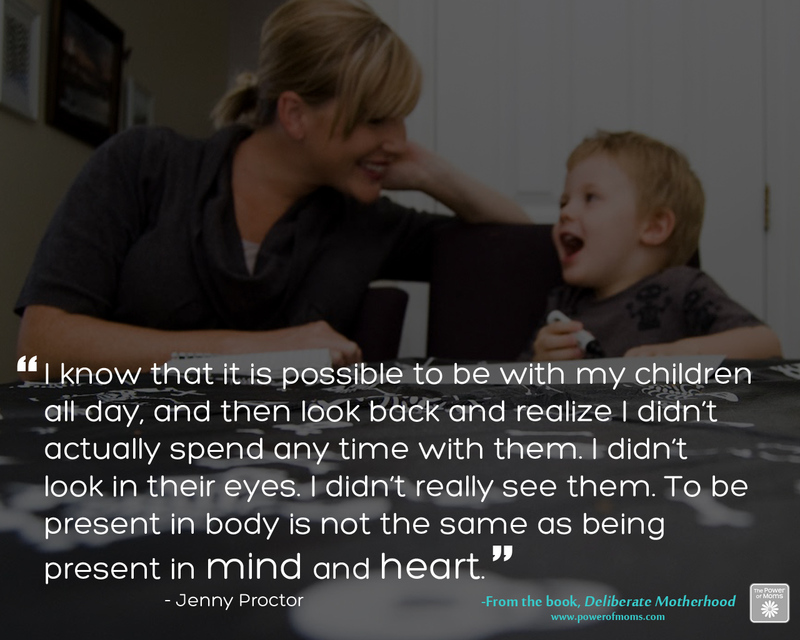 But the moments that we’re able to be mindful, that we chose to consider why our words and actions and attitudes matter, that we realize how much this journey is shaping us as well as our kids – these are the deliberate moments that make the rest worth it. Power of Moms just published their Deliberate Motherhood book (and, full disclosure, sent me a copy to review). And my whole-hearted endorsement is that it echoes exactly what I love about the Power of Moms website. It’s a collection of diverse voices, it’s a positive approach to encouraging moms, and it offers just enough concrete tips to make me think positively about how I could bring a little more mindfulness into my life. The book is organized around 12 “powers” of motherhood – deliberate practices or attitudes that can shape how we face mothering: acceptance, love, patience, individuality, progress, balance, priorities, organization, fun, optimism, and moments. Each chapter is written by a different mom who also draws in stories, insights and ideas from many other mothers who’ve written for Power of Moms. I love the collaborative community voice that emerges here, affirming that our backgrounds and beliefs may be different, but our love for these kids in our lives is fierce. So let’s think together about why it matters how we raise them. Deliberate Motherhood inspired me to sit down and think about the “powers” that guide my parenting – the attitudes or practices that I want to cultivate and pass on to my kids. Without editing myself, I scribbled down my own list of 12: love, forgiveness, faith, joy, gratitude, hope, laughter, curiosity, community, wonder, mindfulness, compassion. Check out Power of Moms to learn more about their work (including another forthcoming book that I’m delighted to be a part of – more details to come!) or connect with them on Facebook, Twitter or Pinterest. And as part of a special giveaway, for anyone who purchases Deliberate Motherhood in September and sends their receipt to dm@powerofmoms.com, you’ll receive complimentary access to the Deliberate Mothering Podcast series (valued at $20). On October 4th, 10 Grand Prize Winners will be selected to receive the Power of Moms Premium Package (valued at $224)! Wonderful. Thanks for letting me know about Power of Moms and this book. I’ll have to check them both out! Take care! Thanks so much for stopping by! Hope you enjoy Power of Moms – their work is wonderful! For me, the most important at this stage of my parenting is acceptance (raising teenagers). But the biggest challenge I am finding is being deliberately patient. 🙂 This sounds like a wonderful book! Awesome review & I love their site. I think acceptance is the most important one for me right now–having two under four years old and realizing I cannot get it all done, cannot necessarily shower even, and must just accept the ups & downs as a beautiful way to live. For me, I think the most important stage of parenting is to Listen. To really Listen. So well put, Jenn. Really Listen, not just half-listen (which I do way too much). Deliberate Motherhood is a must for mothers (parents) in the world today. So many negative influences that we should replace with positives to raise wonderful, kind people. So excited to read this book – Iove following Power if Moms blog! Amen, Lana! Hope you will enjoy your copy of the book! I believe acceptance is most important – of myself, my children, and others. Ironically it’s the most challenging for me too! Melanie, the Acceptance chapter in this book was one of my absolute favorites. Definitely gave me a whole new perspective. Hope you can check it out. Individuality is what I am working on now!! My kids are very different and remembering that when parenting them!! Very hard sometimes, but important!! Such a good point Melissa! Thanks for getting me thinking about this one again. I have a toddler, patience is my current struggle!! Amen, Carissa! Mine too. Always. Thanks for stopping by! Beautiful, Meditator. Unconditional love indeed. I’m gonna go with laughter, because with a 2 year old and a 2 month old there are some days where if you didn’t laugh, you’d cry!